Photo by Paula Court, 2015. Used by permission. Roulette is pleased to remount Crash, the last opera written by American maverick Robert Ashley who, throughout his five-decade career, radically redefined the operatic genre. Crash premiered to sold-out houses at the Whitney Museum Biennial in April 2014, just one month after the composer's death. The Roulette performance will offer New Yorkers a new chance to hear the work with the same cast of young, innovative performers who have been working in preserving Ashley's legacy. The performance will feature Gelsey Bell, Brian McCorkle, Paul Pinto, Dave Ruder and Aliza Simons from the music collective Varispeed, as well as Amirtha Kidambi, with projected photos by Philip Makanna. Scored for six voices and performed in six 15-minute acts, Crash (2014) is the autobiographic account of an older man from age 1 to 84--his attitudes and prejudices as the member of a certain economic and social class. His thoughts are delivered through three levels of mediations, each featuring a different character and distinct vocal style. Character One, singing with the intimacy that comes in phone conversations, muses on the "Seven Ages of Man" that drives the human race, the problem of being small in our society, and the pros and cons of having neighbors. Character Two, singing in the detached, deliberate style one takes to read a classic poem, shares the older man's peculiar physical and mental problems. Character Three, with an almost unnoticeable stutter, describes, very briefly, the important events and ideas this man has lived through. 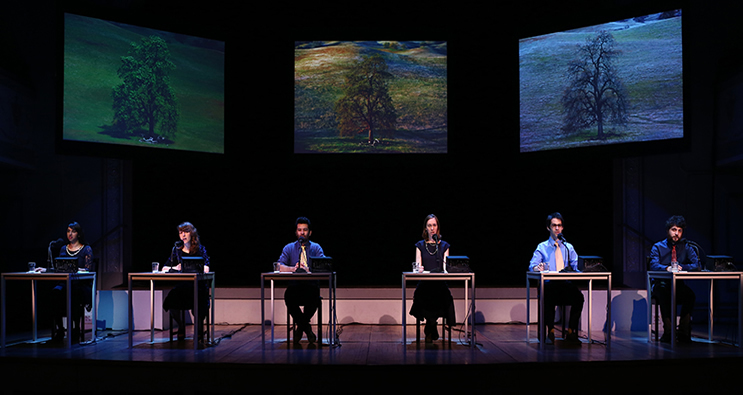 Three simultaneous, but not synchronized, projections of photographs depicting vast, natural landscapes create a meditative context for the audience to hear the singing and the texts. Series Members: $15 pre-sale (ends at noon 4/15). Photo by Paula Court, 2014. Used by permission. Photo byPaula Court, 2014. Used by permission.